Moving Forward or Backwards? 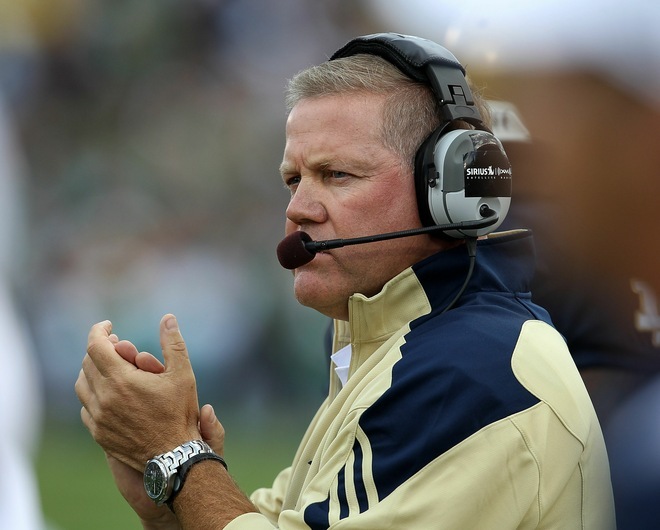 : True Gipper: "Brian Kelly" "Lou Holtz"
At this time it is hard to tell if Notre Dame is actually moving forward or just simply running in place. The Irish blew another 4th quarter lead to lose in OT on a fake FG. The Irish have now lost 6 out of 7 games, blowing 4th quarter leads in 4 out of the past 5. Half of those have came this year against Michigan and Michigan State. This looks like the same team has last year only with a slightly better defense (not on paper) and a worse offense. Last year Notre Dame went 2-1 vs Michigan, MSU, and Purdue but only won by a combined 6 points. We got lucky. already seen numerous people on twitter and other blogs seem to give up on Coach Kelly. in 1986 in Lou Holtz started his 1st season as the Notre Dame head coach, starting off 1-4 and finishing with a 5-6 record—the same 5-6 record from the year before. Coach Kelly was brought to Notre Dame to win championships because of his ability to develop players. It's going to take more time than just spring practice and 3 weeks into the season to be able to develop a team that has been lacking fundamentals for the past several years. Even though the stats are still not better, by just watching a Notre Dame games this year you can see an improvement in fundamentals. Aside from some very bad missed tackles this past Saturday, the tackling is much improved with alot more players wrapping up instead of just trying to hit them. The penalties are down from a year ago, again aside from the 7 penalties from this past Saturday. The season is not completely lost, I like many Irish fans was hoping for a quick turnaround and a BCS bowl berth. We can rule that out now, but I'd still be more than happy to see the Irish land in a respectable bowl like the Champs Sports bowl. These next couple of weeks will be the make or break point in the season. The Irish can win a couple and have a realistic chance at 8 wins but they easily could easily lose a couple and wind up not going to a bowl. Either way i expect the Irish to be in contention for a BCS bowl next year, anything less would be a disappointment.